NovAtel Inc. has released its new SMART-MR15 product, a dual-frequency receiver/antenna combination with an integrated cellular modem. Announced February 15, the new product is targeted at precise positioning (sub-inch accuracy) for on-machine applications. It builds on MovAtel’s launch last year of the SMART-MR10 GNSS receiver/antenna by adding embedded cellular connectivity and NTRIP (Networked Transport of RTCM via Internet Protocol) client software that enables users to easily obtain real-time kinematic (RTK) differential corrections via the Internet, eliminating the need to set up a local base station. 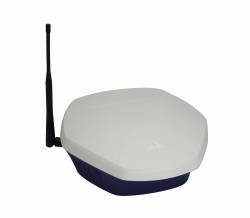 The SMART-MR15 offers a choice of an embedded GPRS/HSDPA or CDMA radio and also supports use of OmniSTAR VBS, XP, and HP services. Ergonomically designed, the SMART-MR15 integrates an L1/L2 GPS+GLONASS receiver, antenna, and cellular modem into a single compact enclosure with a rugged metal housing and external cellular antenna. Its dimensions are 233 x 233 x 90 millimeters. NovAtel’s GL1DE algorithm is integrated into every MR15, designed to provide agricultural users with smooth positions and excellent pass-to-pass accuracy in non-RTK applications. The SMART-MR15 will be shown at leading North American and European farm shows this spring. For additional technical details, see the NovAtel website.